Is the new self acclaimed leader of Indigenous People of Biafra, IPOB, Ezenachukwu Okwudili, spilling the beans on his former boss? Few weeks after claiming he is the new leader of the proscribed secession group, Okwudili claimed that the fugitive ex-leader of the pro-Biafra group fled to London using his British passport. 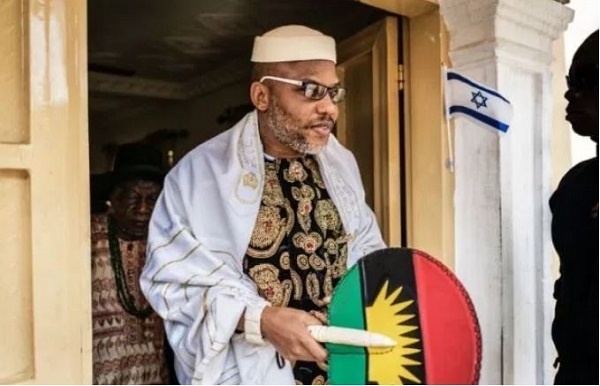 The radio broadcast also accused Law Mefor, the brother of Uche Mefor, Kanu’s former deputy, of collecting money from Igbo traders and businessmen under the pretence of being IPOB’s treasurer. “Money collected so far is in excess of N300million Naira and we are still counting as information about contributors continues to trickle in”.